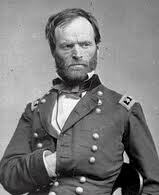 General William T. Sherman has destroyed Atlanta and is confident he can break his supply lines and march his 60,000+ army east to the sea at Savannah,Georgia. Shermans army will live off the land and “make Georgia howl”, inflicting the demoralization to the countryside and state that he knew would break the will of the south. Lincoln’s concern for the possible failure of the plan devised by Grant and Sherman is expressed clearly. Grant has The Presidents’ confidence and convinces Lincoln that Sherman can and will succeed although Grant has his own concerns. The march was a movement of the 2 Western Union Armies of Tennessee and Georgia totaling approx. 55,000 infantry, 5,000 cavalry and 2,000 artillerymen. This grand army of soldiers moved out in 2 columns that will forage for supplies rather than depend on a supply and communication line as was done up until this time. But Grant has seen some success without the usual supply line. Grant understands that an army can move lighter and faster without sharing man power to guard rear supply lines. The main advance had been split into 2 seperate columns with cavalry screen to confuse the Confederate cavalry as to the Federals final destination of Macon, Augusta or Savannah. Practicing a “scorched earth” policy, Sherman’s foragers or “bummers” will take or kill livestock and destroy stores they cannot carry with them. Infrastructure that could assist the Rebel army such as buildings and bridges are destroyed. Railroads are torn up and tracks twisted into ” Sherman’s bowties”. He will reach the outskirts of Savannah on December 10, opposing a 10,000 man CSA force and rice fields flooded to slow his advance. He will punch through to reach the U.S Navy under Rear Admiral John A. Dahlgren, finally being resupplied after 4 weeks of marching and fighting. Shermans March to the Sea will cover 300 miles in length and a width of approx. 60 miles. The basic strategy and tactics of the plan are a success.